Handcrafted Decorative Mirrors have solid wood frames and come in a variety of styles and woods including hall and entry mirrors. 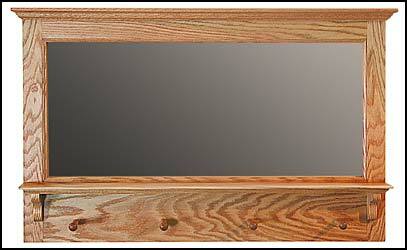 Order a decorative wood mirror with a beveled edge and an etching, or with a regular mirror and no engraving. 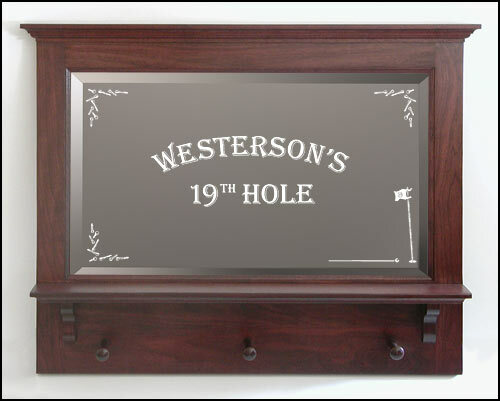 You can also order a personalized wood mirror with a custom etching - We can create custom designed wall mirrors to your specifications. Frames can be ordered with a black matte paint finish. All frames are available in oak, walnut, or cherry. Choose your Frame Molding. Edge can be beveled as shown in front mirror above or flat as shown in back mirror on left. 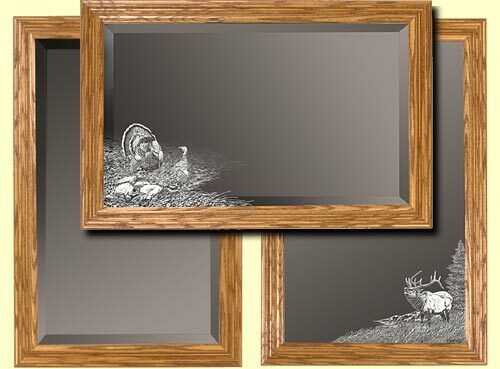 Actual Mirror sizes - 14" x 23 1/2" or 20" x 32"
Can be ordered with etching or without. 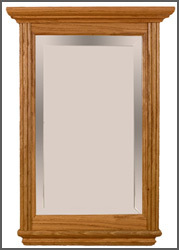 Standard mirror size without frame is 14 5/8" x 23 3/4"
Custom Sizes can be ordered. Mirror Size: Octagon: 14 5/8" x 23 3/4"
Rectangle: 14" x 23 1/2"
Choose your Frame Molding. Edge can be beveled as shown in front mirror above or flat as shown in back mirror on right. 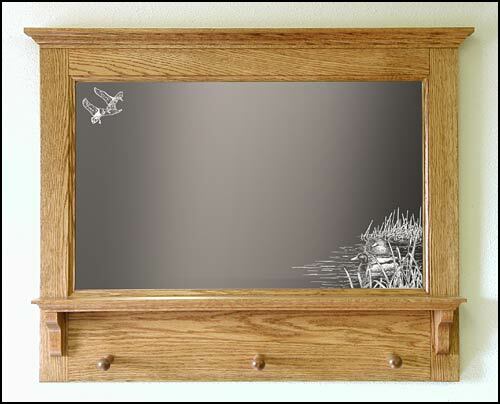 2 Standard Mirror Sizes - 14" x 23 1/2"
Actual Mirror Size: 14" x 23 1/2"
The following 2 mirrors are 36" wide (Crown is 37 3/4" side) x 23" tall. Size of the actual mirror is 32" wide x 14" tall. 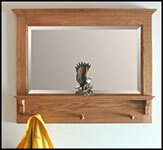 Entry Mirror with shelf and wood pegs. Shelf is 3" wide. Can be ordered in oak, walnut, and cherry. Size: 36" wide (Crown is 37 3/4" side) x 23" tall. Shelf is 36" x 3"
Hall Mirror with double brass coat hooks. Size: 36" wide (Crown is 37 3/4" side) x 23" tall. 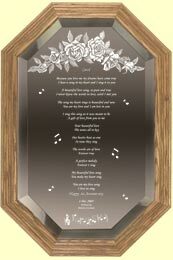 Framed Mirrors and hall mirrors can be custom engraved with text alone or combined with other etchings. 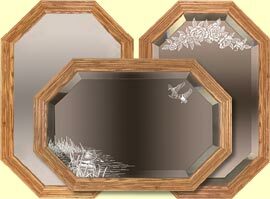 The etching on a mirror can be done on the front or on the back. If the etching is done on the front of the mirror, it is also reflected in the mirror, which some people like and others find confusing. If etched on the back, it is etched in reverse and the silvering is also removed, so it looks correct from the front but there is no reflection. 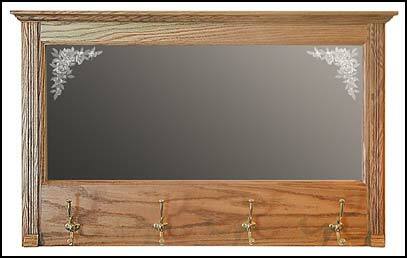 Our borders and etching designs are etched on the reverse side of the mirror unless etching on the front is requested. 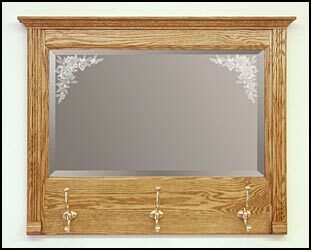 Mirror shown is a rectangle beveled mirror with M01 moulding. This etching can also be used on hall mirrors and octagon mirrors. 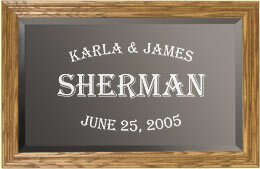 Choose BCPL for the etching on the order form for the mirror style you want.. 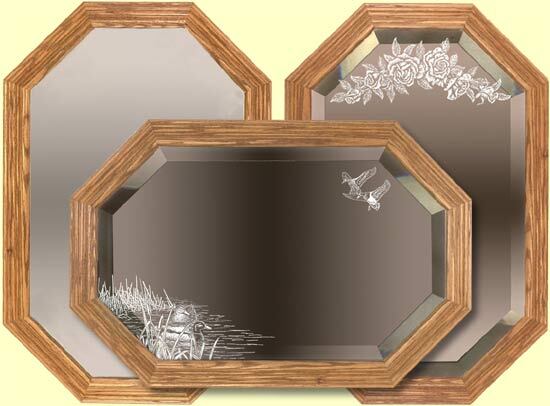 Choose the mirror style you want and BCPL as the etching. 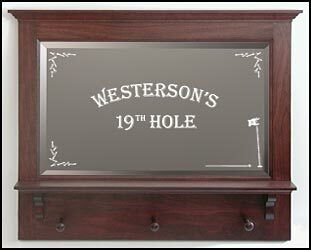 text, and other clipart on octagon framed mirror. . Custom mirror sizes can also be ordered. Contact us for pricing. 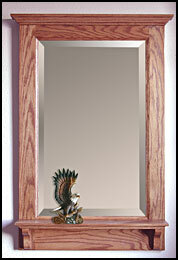 All mirrors can be etched with custom designs, logos, or images as well as our selection of designs.